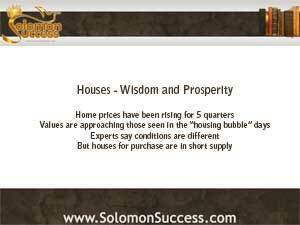 Throughout the proverbs of King Solomon, and the Bible as a whole, a house is a metaphor for prosperity and stability. “Wisdom hath built herself a house,“ says the monarch in Proverbs 9:1. “She hath hewn her out seven pillars.” With “pillars” the metaphor goes even further, implying permanence and solidity. For our world today, too, the behavior of housing has a great deal to say about the stability of the country as a whole. And now, industry professionals are watching rising housing prices as an indicator of the market’s overall recovery. What does all this mean for investors looking for income properties as Jason Hartman advises in this new housing landscape? Although mortgages may be relatively easy to get and rates are low, bargain properties may be in short supply in some markets. New home construction is relatively slow and may not be making much of a contribution to the number of readily available homes. Sellers may be looking for buyers with cash. And the foreclosure and short sale market, which in previous years provided a fairly steady supply of low-cost properties, is moving irregularly. The sharp rise in home prices is expected to level off, avoiding the potential of another bubble. That’s good news for the housing market, and for the economy as a whole. And for the investor, stability in the housing market means better conditions for long term investing success. The Courts: Last Word In Foreclosures?